Our newest sponsor, Britney, from Cookies & Cream is giving away a sumptuous summer treat to one lucky cookie monster (I mean reader)! 1 dozen Cookies - 6 ice cream cones and 6 pieces of candy. This giveaway is valid for one week from today. A winner will be picked with random.org. Good luck monsters!!!!! Nom, nom, nom, nom. MEMO: THE GIVEAWAY WINNER IS LUVDAYLILIES! THIS GIVEAWAY IS NOW CLOSED. Keep Reading - there's another giveaway...just scroll down the page! My Favorite was Ladybug cookiess!!! Oh there are SO many that are SO cute. But I really like the teapot cookies. These are the cutest cookies ever. They must take a long time to make. And they look pretty yummy as well. There are so many different designs. I love love the dresses that are swinging. They are just darling. Actually they are all great designs. I love the button cookies. Too cute! How do I choose a favorite? 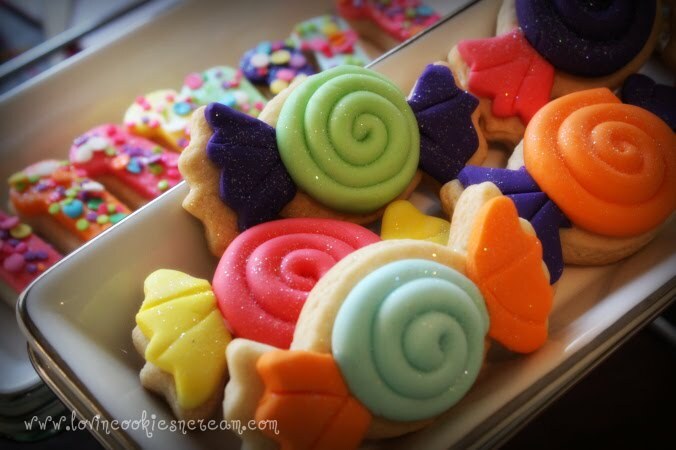 I love the fish cookies (perfect for my bro-in-law), or the ladybug cookies (wow! ), or even the birthday present for anyone! Amazing eye for detail on these cookies. Oh my goodness! How can one choose a favorite out of all of those fabulous treats?! I really can't just pick one! I love them ALL - but those ice cream cone cookies are calling my name! Whar a wonderful variety - they are all so beautiful! It is really difficult to choose. All the cookies are amazing. I'd have to say the lady bug cookies and initial cookies are two of my favorites. Well, the cookies you chose to show on your blog are some of the cutest! I also like the cupcake cookies. I love cookies.period. I'm a cookie girl. These are adorable cookies. I love the lady bug & the cupcake cookies. So adorable! I love the ladybug cookies!! OH SO DELECTABLE!!! These ice cream cone cookies and spritely colored candies are so pretty to just look at!! Can't help but wonder what yummy flavor bursts through all the gorgeous colors? I'm dreaming.........UMMMM!!! I LOVE everything Britney does but out of the cookies I would have to say the flip-flops are my fave!! Becky's Cookies are beautiful but I would definitely choose the ROLL TIDE cookies as my favorites!!! I'm a flip-flop gal, so I'd have to say they are my favorite cookie! Amazingly beautiful stuff!! I like the patrick starfish cookies. Thanks for the chance. Seriously?! to pick a favorite....very hard, but I'll choose the simple monogram cookies. One of my daughters is into everything monogrammed now and she would love those! Thanks for the giveaway! 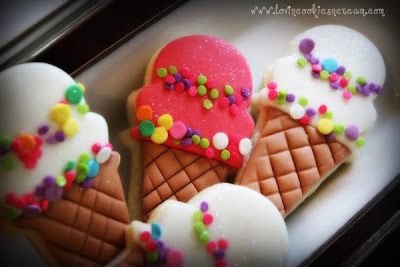 Okay, I love the zebra cookies - but also, the ice cream cone ones...especially for summer!